Will China Economy Boom Turn into Doom? As china chugs along non stop, it may just be that time of the year where we wait and introspect on the great juggernaut. Does the data point to any chinks in the armor? Do we see the economy crash landing with all the hikes priced in? Some of these questions will be answered as we bring some charts on the Chinese economy. 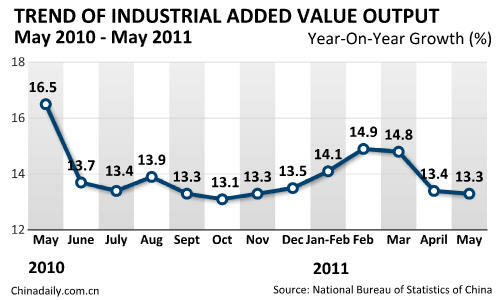 Some charts have June 2011 as a data point while others only map till May 2011. As the data is released, we will update all charts to June 2011. China’s inflation escalated to the highest level in three years amid lingering pressure, with the consumer price index (CPI), the main gauge of inflation, jumping 6.4 percent year-on-year in June. The June inflation rate accelerated 0.9 percentage points from May’s 5.5 percent which stood at a 34-month high, both far exceeding the government’s annual inflation control target of 4 percent. Of the 6.4-percent CPI growth in June, 3.7 percentage points were contributed by the carryover effect of price increases last year, the NBS said in a statement on its website. 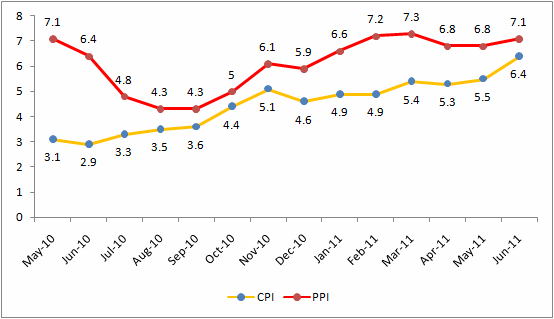 Analysts though believe that China has seen its peak inflation in June. Prices should come down over the next few months as food supplies improve and rate hikes work their way into the economy. 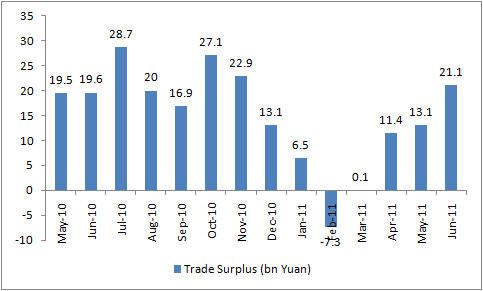 China’s trade surplus in the first half of this year fell 18.2 percent from a year ago to reach $44.93 billion. During the same period, total foreign trade value topped $1.7 trillion, up 25.8 percent year on year, with exports up 24 percent to reach $874.3 billion and imports surging 27.6 percent to hit $829.37 billion. In June, exports and imports reached $301.69 billion in value, up 18.5 percent year on year. In breakdown, June’s exports hit a record monthly high of $161.98 billion, up 17.9 percent, but the rate of growth decelerated from the 19.4-percent increase in May. Imports reached $139.71 billion, up 19.3 percent. The growth also slowed from the 28.4-percent increase in May. China’s new bank lending shrank in May and money supply grew at the slowest pace since 2008, signifying the effects of the country’s tightening measures are paying off. New bank lending, an important indicator of the monetary policy, tumbled to 551.6 billion yuan ($84.86 billion) in May from April’s 739.6 billion yuan. 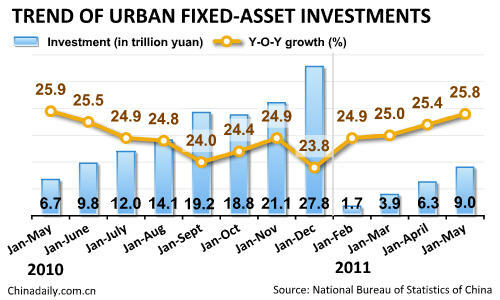 The figure was also 100.5 billion yuan less than that of last May. 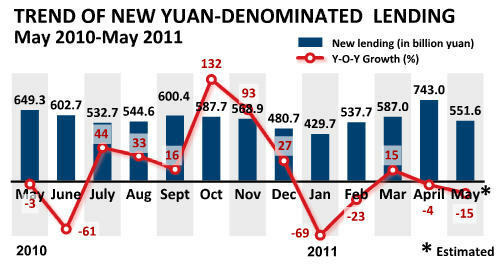 Yuan-denominated loans outstanding at the end of May were 50.77 trillion yuan, 17.1 percent higher than a year ago. By the end of May, the broad money supply (M2), which covers cash in circulation and all deposits, hit 76.34 trillion yuan, up 15.1 percent year-on-year. The rise of M2, following an increase of 15.3 percent in April, was the the slowest growth since November of 2008. May was the third consecutive month that the country registered slower M2 growth. The narrow measure of money supply, cash in circulation plus current corporate deposits, rose 12.7 percent from a year earlier to 26.93 trillion yuan. The increase was 17.2 percentage points lower than the same period of last year. 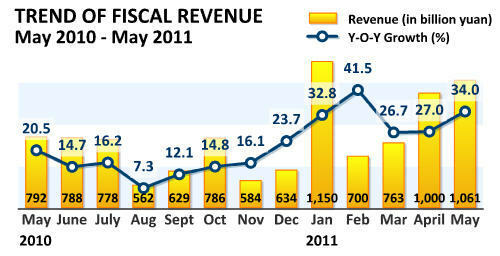 Fiscal revenue rose 34 percent year-on-year to 1.061 trillion yuan ($163.6 billion) in May. 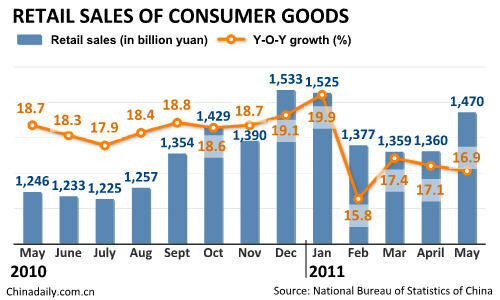 China’s retail sales of consumer goods rose 16.9 percent year-on-year to 1.47 trillion yuan ($226.77 billion) in May this year. - The purchasing managers’ index (PMI), a key gauge of manufacturing activity, hit a nine-month low in May, sparking fears that ongoing monetary tightening measures may slow economic growth. But analysts said the economy would still manage a soft landing as the country tries to curb inflation and shift the economic growth pattern. The PMI dropped to 52 in May. The figure was down from 52.9 in April and 53.4 in March and showed across-the-board declines in all categories. 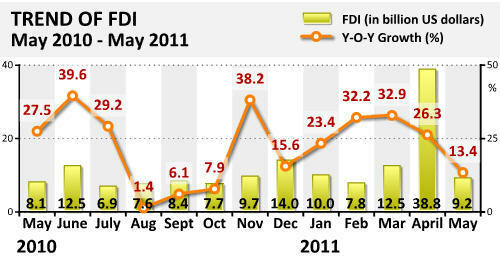 Foreign direct investment (FDI) in the country rose 13.43 percent year-on-year in May to $9.225 billion. The growth rate slowed from an increase of 15.21 percent for April when FDI stood at $8.46 billion. The May figures brought the total FDI for the first five months of this year to $48.03 billion, up 23.4 percent from a year ago. The FDI rose 26.03 percent from a year earlier to $38.8 billion in the first four months. China approved 2,391 foreign-invested companies to start business operations in May, up 12.15 percent from the same month last year. A total of 10,543 foreign firms received approval in the first five months, up 9.39 percent year-on-year. China numbers , if true, indicate a sold and robust economy with debt/gdp ratio at 50% and a demographic to die for. This country is going to take over the world in the next 10 years. Bio: Worked with a hedge fund for 10 years as a Director and now work with the consulting firm "GMB post"
How come no mention of the 'empty cities' in China? If you want to take over the world you would want to invest your money wisely. China no doubt makes some mistakes, empty new cities and unused shopping malls, etc., but it is moving forward dynamically and has many of its priorities right. It is obviously investing its money wisely overall. It does not have 20% unemployment like the U.S. -- a huge human waste and tragedy. It does not waste half of its government budget on a criminal military. China's government is not occupied by a parasitic financial oligarchy. It has government owned banks that function in the public interest. China is not "taking over the world", but rather peaceably doing quite well by virtue of intelligence, hard work, and a practical economic ideology. Look for it to build 20 huge new cities(which will be occupied! )and continue to put ther U.S.A. to shame with the accomplishments of its people-oriented rather than financial oligarchy oriented system. 18 Jul 11, 14:45 The Chinese are Toast. There has never been a more stupid bunch of people in all of recorded history. The Chinese turned up to the great game of Industrialisation a Day Late and a Yuan Short, they have a thoroughly polluted environment, a lack of clean water, and 1.3 billion hungry mouths to feed. Their "savings" are worthless, they will never be repaid. Read it again.....The Chinese are Toast.